Bobrick Washroom Equipment Inc. a 100+ year old washroom accessories and partition manufacturer has a seamless industry presence. The heritage of a century and proficiency in designing helps Bobrick to deliver precision solutions to meet customer requirements. Bobrick has six manufacturing facilities across the United States and their strategic location assures swift product delivery in every State of the Continent. Bobrick is committed to deliver outperforming products to meet exceptional standards of performance and quality. The designing excellence and precision manufacturing make each Bobrick product a masterpiece you deserve. In fact, Bobrick offers premium designing, making each product outshine and make a status symbol for you. With the expertise and the proficiency, Bobrick has created many milestones in the industry and these milestones make your washrooms deliver the peace of mind you deserve. Bobrick products make your washroom more intimate like never before, and therefore, spending a few moments in washrooms is more enjoyable when you have Bobrick products around you. Bobrick is a privately owned family business and respects the true work-life balance. Earning the respect and customer satisfaction is always a proactive move and Bobrick assures the integration of the necessary elements to achieve it. Since 1906, the Bobrick brand has been providing a full line of washroom accessories and partitions. Bobrick is headquartered in Hollywood, California and has grown to include six manufacturing facilities in North America, with products sold in over 85 markets across the globe, while continuing to be a private, family-owned operation. The Bobrick family is guided by four principals: do the right thing, offer the best value, treat each employee with dignity and as an individual, and to continuously improve. These four core ideas have allowed Bobrick to make the best washroom accessories in the industry, while providing top-tier service, from employee to customer. 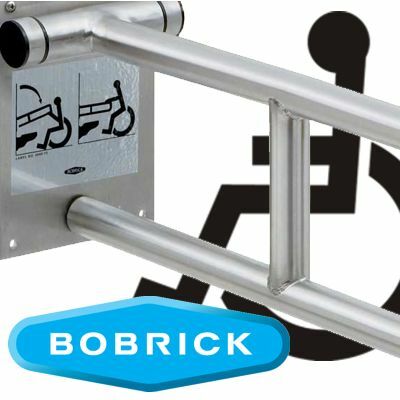 Bobrick is proud to provide a full line of washroom accessories including toilet partitions, baby changing stations, hand dryers, mirrors, paper towel dispensers, grab bars, waste bins, sanitary tampon vendors, seat cover dispensers, toilet tissue dispensers, and towel/waste units for commercial applications. Bobrick washroom accessories can be found worldwide in such venues as luxury resorts, hotels, hospitals, institutions, and government facilities. Being green is a top priority at Bobrick. You will notice green leafs throughout the product line to signal products that go above and beyond to save paper and/or reduce waste. This commitment has led to Bobrick getting LEED certified.